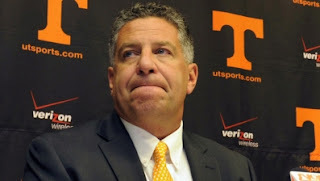 Even though the University of Tennessee wanted to stand behind their coach, in the end he made it impossible. Bruce Pearl was fired late Monday for unethical NCAA conduct. Pearl admitted giving false information to investigators regarding having high school players at his house for a cookout, and also didn't notify the university of another potential recruiting violation this fall. Since the start of the investigation against him, the NCAA has charged Pearl and the Tennessee basketball program with over a dozen violations. My take on the whole situation: Pearl was a great coach, but I agree with Tennessee's decision 100%. If the NCAA is going to come down hard on the players, it needs to come down equally as hard, if not harder, on their coaches. Reggie Bush was stripped of his Heisman trophy, and Jim Tressel was slapped on the wrist with a 5-game suspension? While it's unfortunate that Pearl had to lose his job over the violations, it was definitely the right call by Tennessee. We can't expect the players to adhere to the rules if we don't hold their coaches to the same high standards. Agreed, this was well done.